Ukraine's representative in the Trilateral Contact Group (TCG) and former Ukrainian President Leonid Kuchma continues carrying out this work. He will participate in a regular meeting in Minsk on November 23, his spokeswoman Darka Olifer has said. "Leonid Kuchma continues fulfilling the work of Ukraine's representative in the TCG. And in Minsk, on November 23 he will take part in the meeting of the group, where the key issues for discussion are the issues of security and the release of hostages. In particular, they will talk about the violation of the cease fire regime and about the implementation of the Framework Decision of the TCG on the disengagement of forces and means," Olifer told Interfax-Ukraine on Wednesday. 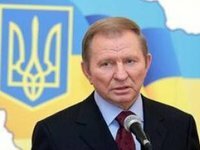 Earlier Kuchma told reporters that he had been asking about his resignation from the post of the Ukraine’s representative to the TCG for a long time, but his substitute has not been found yet. "All the time I have been asking to excuse me from this job. I am the only one who remained from the original staff of the team. Russia has already changed two of its representatives…I am pleased to hand over my powers, if someone can do it better," Kuchma said.